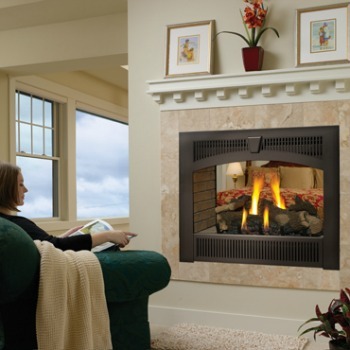 The Fireplace Xtrordinair 864 | See Thru Fireplace lets you enjoy fire from two rooms at once! This see through fireplace allows you to adjust the heat output to enjoy the ambiance of fire year round, with the Comfort Control. Each side of the fireplace can be tailored to compliment each individual room's style and taste; customize with your choice of log set and face. Not only can the Fireplace Xtrordinair 864 heat two rooms at once, it also features premium quality glass that comes with the ANSI-compliant safety screen. This screen boosts the overall safety of this unit for your home. Consider adding the optional Power Heat Duct Kit to transfer heat to an adjacent room - nearly 25 feet away. If the project is outside of Southwest Montana please visit the FPX site for dealers that may be near your area. Bare's may only sell these products bought and picked up from our store locations. Please understand we are unable to ship, sell, deliver, install, service or provide warranty for items outside of our area. ​​​Would you like to see more options? 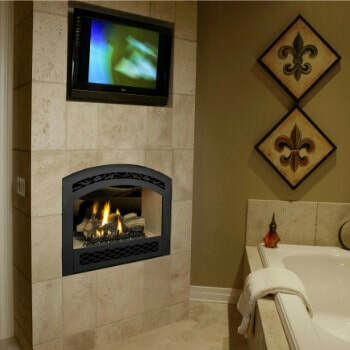 This unit can be used with Lopi fireplace accessories and faces. Visit the following for more great options.